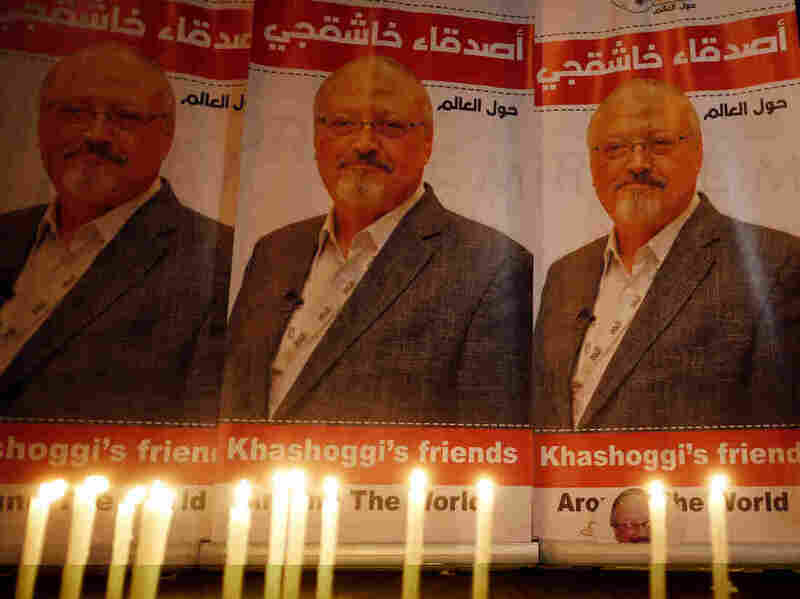 Trial Begins For 11 Suspects In Killing Of Saudi Journalist Khashoggi Saudi Arabia's Public Prosecutor says it is seeking the death penalty for five of the suspects in the grisly killing of Jamal Khashoggi last year in Turkey. Candles burn in a memorial to slain journalist Jamal Khashoggi outside Saudi Arabia's Consulate in Istanbul in October 2018. It is the latest development in a case that has triggered a reckoning about U.S. support of Saudi Arabia in the war in Yemen, as well as the financial influence of Saudi Arabia in Washington, D.C., Hollywood and Silicon Valley. Khashoggi was a Saudi journalist writing and living in self-imposed exile in the United States. He entered the Saudi Arabian consulate in Istanbul on Oct. 2, 2018, and never emerged. As NPR previously reported, Saudi Arabia at first denied he was killed, then claimed he died after a fight, and finally admitted the killing was premeditated. Khashoggi's body has not been found. A CIA assessment concluded that Saudi Crown Prince Mohammed bin Salman approved the killing of Khashoggi. If convicted, the suspects may face the death penalty for carrying out official orders. "Maybe he did and maybe he didn't," Trump said of the crown prince's knowledge of the killing. Still, the Trump administration has imposed sanctions on 17 Saudi officials believed to be involved in the act, NPR's Jackie Northam reports. In December, U.S. senators outraged over Khashoggi's death passed a resolution banning U.S. military aircraft from providing in-flight fueling to "non-U.S. aircraft" conducting missions in the Yemen conflict. The Senate also passed a resolution meant to hold the crown prince responsible for the killing of Khashoggi, NPR's Bill Chappell has reported. Saudi Arabia has rejected that accusation. Prosecutors said they have sent five letters to Turkish officials asking for evidence related to the killing, but hadn't yet received a response. Ankara has demanded the suspects face trial in Turkey, but Saudi Arabia has refused. While the 11 defendants review the charges with their lawyers, the Saudi Public Prosecutor said Thursday it would continue to investigate "the rest of the individuals in custody in relation to this crime." In November, the prosecutor's office said it had 21 suspects in custody.